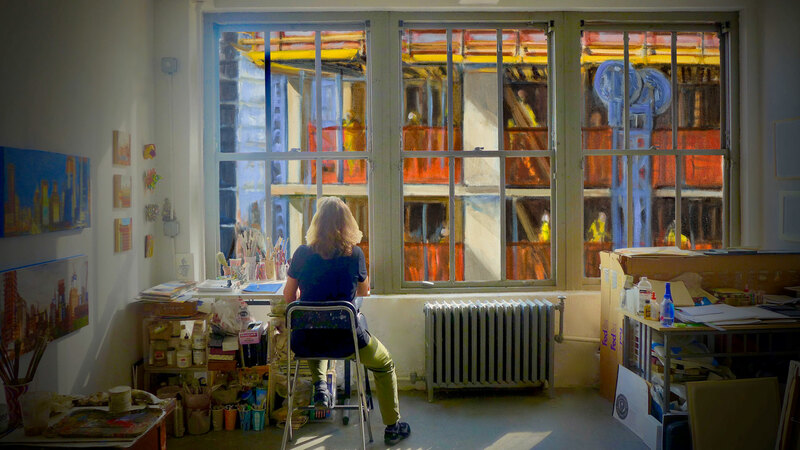 Celebrated NYC artist, Gwyneth Leech, walks into her midtown Manhattan studio only to discover that her stunning, 16x9 skyline view will now be blocked by the construction of yet another high-rise. Directed By Angelo J. Guglielmo, Jr. Produced By 4235 PRODUCTIONS, INC.
Full disclosure: I’m tired of artist profile docs. That might seem unfair, but considering how many shorts I watch, you’d be surprised how many are about a painter…or a sculptor…or a custom guitar manufacturer. As the barrier to making good looking films keeps shrinking, the result is a crowded nonfiction landscape that can be difficult (and exhausting) to navigate. This is all a long-winded way of saying that Angelo Guglielmo Jr.’s The Monolith is special. Yes, it’s a profile doc about a painter. But, it’s a film that both charmed and engaged me. And, considering my fatigue with this particular sub-genre, that’s definitely worth noting. So, what makes Guglielmo’s film better than so many other competitors of the same ilk? It’s tough to say exactly. In terms of craft, there are better looking profile docs (we live in an age where gorgeous cinematography is practically commonplace). No, the real genius here is how the film is structured. What starts as a frivolous act of painting on coffee cups, becomes a meaningful and emotional journey—transforming the mundane into the profound. In the case of The Monolith, this is centered on the construction of a skyscraper in Manhattan (not a particularly noteworthy occurrence). However, through artist Gwyneth Leech’s creative lens, it becomes an event worthy of great beauty and awe. Proving the power of art, Leech is able to transform the pedestrian (like the coffee cups she’s famous for doodling on) into the profound. A construction site is magically transformed into a symbolic representation of one’s place in life. And, in turn, the film ends up being greater than sum of it’s parts—a short that while not the most polished visually, really grabs the viewer emotionally, without ever succumbing to saccharinity. Director Angelo G. wisely waits until the later portion of the film to hit the viewer with its personal kicker. Moreover, The Monolith is bolstered by a quick sense of pace, driven by an excellent edit style. “I wanted to make a film where the journey of the artist was just as galvanizing as the art. I also love narratives that are jam packed with story. The short form gives you a great platform to dive in.” – Director Angelo G.
With The Monolith premiering online as a Vimeo Staff Pick, it’s clearly a film that is going to inspire and move many. Guglielmo is currently hard at work on future projects, including a VR piece he’s written and two screenplays that he’s attempting to set up for his feature debut.